The iMC® 8000 series of Interchangeable Keystone® compatible Modules are part of this Interchangeable Modular Components system, and have been designed with multimedia and data needs in mind and in which the key feature is the inherent interchangeability and configurability in the field of the modules.Using the full line of iMC® modules, these panels can be configured for a variety of multimedia applications. 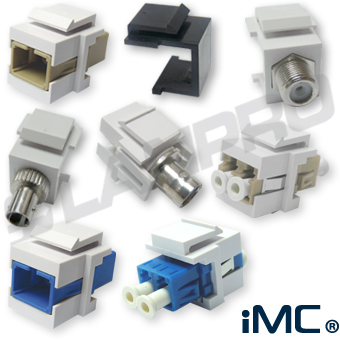 You can use our line of iMC 8000® series compatible LanPro´s Optical adaptor modules of different types: ST, SC, LC, MTRJ for standard multimode and single mode fibers. There are also modules for signals like Audio RCA to 110 jacks, Audio Stereo 3.5 mm jacks, Video, CATV, RF , binding posts for banana plugs. Also for data like USB ports and HDMI Port connectors. Some are active modules like Infra Red Receivers. These patch panels also accept our line of iMC 8000® series compatible CAT3, CAT5e, CAT6 and CAT6A RJ-45 jacks. Blank modules in several colors may be used to reserve ports for future appliCATions. Note: the 7000 series of Rj-45 modules are not suited for this appliCATion. 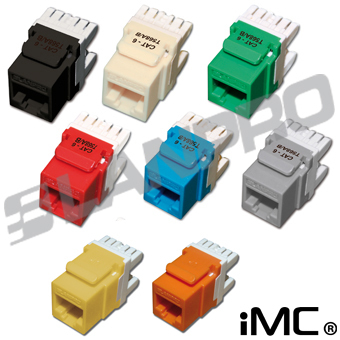 The iMC® 8000 series of Keystone® shaped 6P6C Cat 3 and 8P8C Cat 5e, Cat 6 y Cat 6A jacks are compatible with the iMC® 8000 series of Patch Panels and let the user choose the best configuration for the application. The iMC® 8000 series of Patch Panels is the basis for the Interchangeable Modular Components system of modules, and has been designed with multimedia and data needs in mind and in which the key feature is the inherent interchangeability and configurability in the field of the modules. 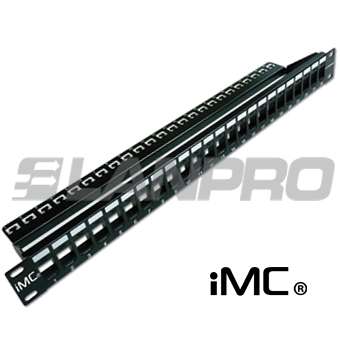 Using the full line of iMC modules, these panels can be configured for a variety of multimedia appliCATions. These patch panels accept our line of iMC 8000® series compatible modules and the LanPro Series 8000 of CAT 3, CAT 5e, CAT 6 and CAT 6A RJ-45 jacks. The 7000 series of RJ45 modules are not suited for this application. They come in three sizes, 16 ports, 24 ports and 48 ports. Blank modules may be used to reserve ports for future applications.